NEW STATISTICS RELEASED by the Central Statistics Office show that Volkswagen has pipped competitor Toyota to be the most popular car in Ireland so far this year. The German manufacturer overtook Toyota in new car sales during April, with a total of 6,102 units sold this year, ahead of the Japanese player’s 5,634. It’s the same result when total sales are taken into account, with both Volkswagen (8,264) and Ford (7,646) beating Toyota’s 7,181. Overall, the number of new private cars licensed for the first time increased by 44.9 per cent compared to April 2014. 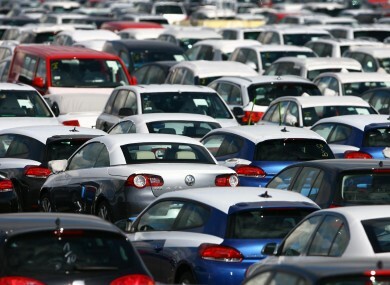 For the year so far, there’s been 51,123 new car sales compared to last year, an increase of 30.7 per cent. Goods and commercial vehicles, sales of which are often seen as a good indicator of how well the economy is doing, also climbed by a third to 1,502 in April. For the year to date, commercial registrations are up 46.1 per cent to 1,926. The total number of new cars licensed in the year went up to 61,051, a 31.7 per cent increase on 2013 numbers. For April the total figure was 14,178, up 4,121 or 41 per cent on the same month last year. Email “What's Ireland's new favourite car?”. Feedback on “What's Ireland's new favourite car?”.